Watching cultural events on TV these days is rarely the passive experience it used to be. With more and more women concurrently using media, it is increasingly more common for women to watch an event on television with a smartphone, tablet, or laptop in their hands, using the device to search, share, and consume content while watching the event, or shortly after the event has concluded. As part of the POPSUGAR Insights Content, Commerce, and Culture study, we surveyed over 1,500 women between the ages of 18-44 and asked them to tell us the actions that they've taken as a result of watching a cultural event on TV. Overall, social media interactions dominate the list of leading actions that women take while watching events on TV. 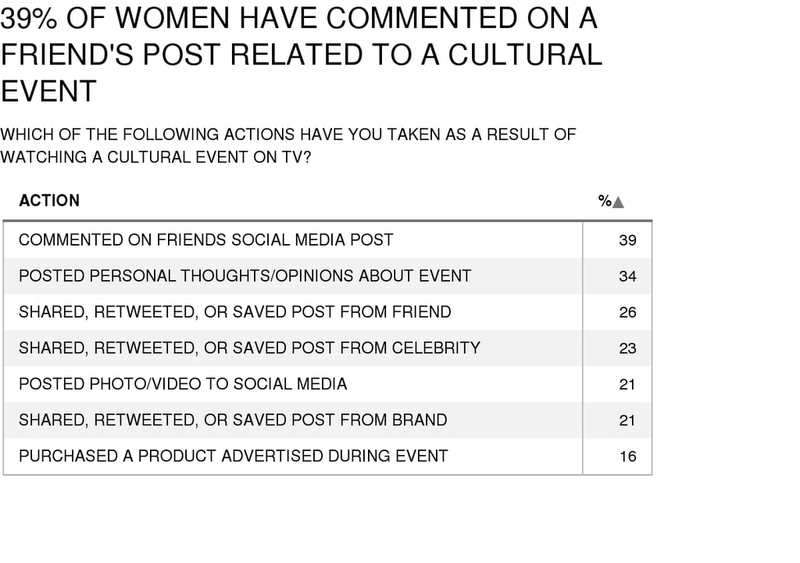 Thirty-nine percent of women have commented on a friend's social media post related to the cultural event they were watching; 34% of women have posted their own thoughts and opinions about the event on their social media account; 27% have shared, retweeted, or saved a post from a friend on the event; 23% have shared, retweeted, or saved a post from a celebrity; and 21% percent of women have shared, retweeted, or saved a post from a brand. Twenty-one percent of women have posted a photo or video of the event to social media, most likely of their television screen or their reaction to something interesting that occurred during the event. Watching cultural events on TV can also prompt women to take action and purchase the products that are shown during the event or during a commercial shown during the event. Overall, 16% of women said that they have purchased a product that they saw advertised during the event.